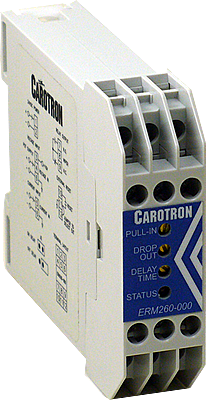 The Electronic Relay Module, Model ERM260-000, is a voltage and/or current sensing relay. The module provides inputs for a DC voltage and DC current input. These inputs are summed together and compared to with an adjustable PULL-IN level. When the external signals exceed the PULL-IN level, the relay is energized. The module has two modes of operation for de-energizing the relay. In the INTERNAL mode, the relay will de-energize when the sum of the external signals fall below an adjustable DROP-OUT level. In the EXTERNAL mode, the relay remains energized until reset via an external contact closure. A status LED is provided for visual indication of the relay state (relay is energized when LED is on). Furthermore, jumper J2 provides a selection for either ON DELAY or OFF DELAY. A multi-turn potentiometer is used to adjust the delay time. When power is applied to the module the LED will flash once if ON DELAY is selected and twice if OFF DELAY is selected.